I have just finished another painting on papyrus, it’s been a while since last had the chance to paint one that wasn’t commissioned. This is one of the very few ones I have painted on dark papyrus. 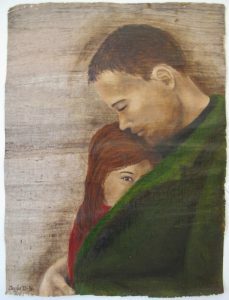 The painting is called “Safe Haven”, it’s 41×31 cm (size not including frame). The price is Nkr 4 500,- (including frame, as with all of my paintings) You can find it both in the For Sale-gallery and in the couple-gallery.